We have just completed another committee meeting, held at Trevor’s the other evening, and it always seems to be a reality check when we start discussing Christmas and the events for the coming year. This past year started off as a disappointment when the poor weather caused the postponement of our major fund raising event at the Belper Steam Event. Several of us attended the rearranged event for the 2 days in September, and what a success it was – raising £581 for our nominated charity – The Rutland School for Parents. Thanks to your efforts in producing many different items for the past year we were able to increase that amount even more when we also attended the West Hallam Ploughing Match event, also held in September. Adding the monies for the club raffles, together with other donations, together we have raised upwards of £1,000 – an excellent achievement. Christmas time is now into our thoughts and on that note, tickets are now on sale through Pat, for our Christmas Social on Wed. 12th December. Last year was a resounding success, so please consider supporting this evening by purchasing a ticket. See details in this edition. Our club’s limited storage space has always been an issue, and the energies involved in removing and replacing the large Myford lathe are becoming increasingly difficult. For that reason we have decided to sell the Mystro lathe and purchase another smaller lathe. We are therefore offering the Myford Mystro lathe to our members. See details in this edition. debris, and also to those who help and volunteer to set and serve the teas and coffees. year, the opportunity was taken by Heather Peake to undertake a total revamp of our website – and what a superb job she has done. Have a look yourself on www.evwa.org.uk, and let me know if you agree. Our annual competitions, the Chambers Cup and the Keith Rowley Rose Bowl are to be held in the November meeting, so if you haven’t yet produced your entry/entries, we are still a few weeks away for you to produce your winning entry for this year. So keep on turning, but always with your own health and safety in mind. Hands On evening – hosted by Mike Puls. suitable timber for the evening. Kitchen roll holder – 6.5dia x1.75ins for base and 1.5×1.5x12ins for stem. Remember to bring along your own tools, roughing and spindle gouges, parting tool and skew. The club’s grinder will be available for use. This will be the last Hands On for this year. Keith Rowley and Chambers Competition. These are both OPEN competitions. The Keith Rowley Rose Bowl Competition is open to all members except last year’s trophy winner. The Chambers Cup is open to all members except all previous prize winners in this competition. This competition is ideal if you have not yet competed or won in the past. In addition to the trophy for the winner, there are cash prizes for the top three and vouchers for all other entrants to the competitions. This is the evening for our annual Christmas Social. Tickets are still only £10 per person. The evening is always a time filled affair, with a raffle – a quiz – a Christmas turning competition, (bring along your entry) – a cold buffet meal – and an entertainer. The evening rounds off with the presentation of the two competition trophies and prizes. The entertainer this year is Craig Deegan who has appeared in such shows as ‘Me and My Girl’ and ‘Cabaret’. Remember to bring your own glass and bottle of beer/wine. 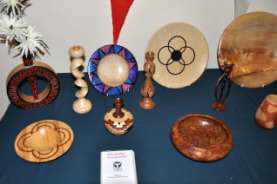 Member’s evening – this is now held on an annual basis, where we invite a number of you to give a little time during the session to maybe give a talk on how you made a particular piece, maybe what disasters you have encountered in your woodturning, and how you overcame them. Or explain an idea or concept you have or a different technique you may use. So, in the coming few weeks, you may encounter Trevor touting for support for this evening, and… if you have an idea to promote the evening please do not hesitate to discuss with Trevor. Hands On evening – hosted by Rachel and Geoff Evans. Rachel has a strong interest in pyrography and has suggested that the evening will be themed around this topic. It will be an interesting variation to our normal focus on woodturning that may be adopted for many of our charity items of the coming year. Margaret Garrard has been a professional woodturner for some 12 years or so and has produced some stunning gallery work, with an emphasis on pierced items. 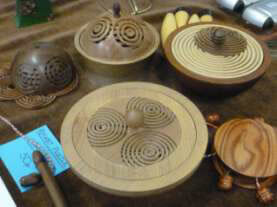 However Margaret also gets involved in the more traditional woodturning such as repeat spindle work, as required. The day promises to be a very rewarding one – so place this in your diary for early next year. Alan Truman – a welcome return for Alan whose skill and attention to detail is always inspiring. 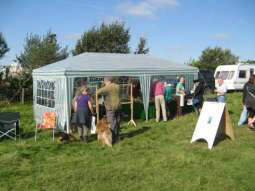 Alan frequently sells pre-prepared timber, following his demos, to assist us in utilising his ideas. As mentioned in the last Turning Times, the format continues to be successful. The items made at each session are collected towards all items made and put towards our fund-raising stock, to support our nominated charity. Over the years we have recognised that certain items are far more popular as tombola prizes. So it is reasonable to suggest that at future ‘Hands On’ we look towards focussing on those items. To this effect, we intend to put together a series of A4 project leaflets in a folder for the benefit of members, such as a design of:- mushrooms, animals (hippos, mice, owls, etc. ), cup & ball, ear-ring and ring stands, fruit, as so on…. The idea being that you as members add to this list your own designs and variants. Your opinion would be appreciated. The CLUB’S MYFORD MYSTRO LATHE is now for sale. We are selling the lathe and stand as one item. NOT included in the sale are chucks, tail centre and the wheels (of the stand), and the multi power lead currently attached. We are looking for £350, and would request all offers to be put in writing to Trevor, or as an email to me. Any offer will be treated in strict confidence and the best offer will be accepted on the closing date of sale – which shall be the end of the day of Wed. 31st October 2012. If it is not sold – then beyond this date the lathe will be offered to others. We have only one pair of eyes. (I have only one eye that works). We must look after the eyes we have, we cannot get another pair on the NHS. Always wear eye protection. When using the grinder, waste comes off a 6 inch stone at a peripheral speed of around 60 mph. Circular saws, and particularly chain saws, have about the same trajectory speed. 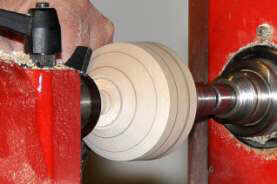 Loose bark, splits or lesions can also be very hazardous when spinning on a lathe. Do not be drawn into a sense of eye safety simple by wearing prescription glasses, the lens may shatter upon any impact, with disastrous results. Obtain safety prescription glasses – the lens are made from shatter proof material, and have wrap around sides to them. Most designs of goggles fit over ordinary glasses, or best of all wear a full face mask. David took up the reins at very short notice when Peter Tree was unable to demonstrate. David’s preamble explained that his purpose made tools, jigs and chucks are of the most simple of designs. To prove this he went on to produce a lattice patterned lid for a box or pot-pourri vessel, using a jig with pan-headed screws and a tool tip ground to 2mm tip to cut the grooves. With the work piece held in the jig concentric grooves were cut halfway through the workpiece. The grooves were sanded with the abrasive bent as ‘gull wings’ to prevent any snagging. Important to use close grained wood for this project The piece was reversed and off-set into the first of 3 holes, and screwed to the centre of the jig. Further concentric grooves were cut half-way. This was continued for the remaining 2 holes in the work piece. David then explained a number of important points when making a star inside a sphere. The notable one being to always start by turning the end grains, i.e. the N and S poles. Then David went on to explain the construction and differing effects that may be achieved from his ‘Evolution’ series from his recent publication of the same name. A lace bobbin was produced and David suggested using bone for a solid, stable and robust item. Finally with time running to a close, he made a small ‘bullet’ puzzle and gave away the secret to the answer!!!!! A varied and enjoyable evening – what else from the master of Wizardry!! Guy commenced with a demo of spindle turning, first the roughing gouge, and then used the long and the short end of skew to clean up the ends, then a planing cut with the skew. Concave and convex cuts were shown using the spindle gouge. Guy suggested many beginners would be better using a bowl gouge, point tool and a parting tool. The turning of a perfect sphere was the demonstrated using a precise formula for tangential cuts the multipliers being 0.29 for the first set of cuts and then 0.11 for the second set of cuts. The next topic was to produce a candle stick shaped tea light. Several members commented that an insert should be fitted before the tea light. Pewter casting – pewter was heated during the tea break and using a mould Guy had turned from ash a pewter ring was cast. A blackwood box lid was turned. the pewter ring was shaped initially in the mould and then the mould was turned to release the ring. 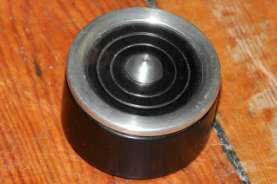 The ring was glued using CA glue into the blackwood lid and then finished with a scraper. Next a rectangular bowl was turned from a half log of laburnum, initially between centres to form the chucking point on the base. 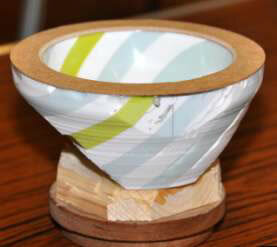 Once in the chuck the bowl with a natural edge was skilfully turned. Guy gave an interesting evening’s demonstration, using a variety of tools and explaining their use throughout. This was a full day demo from Dennis, commencing with a slide show and commentary of his personal history, the development of segmented turning and the influence of North America and in particular individuals such as Ray Allen and Malcolm Tibbetts. 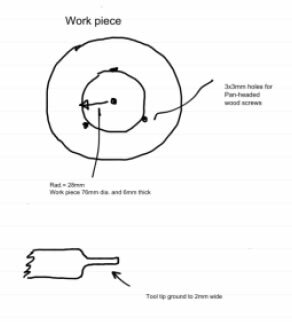 Dennis emphasised the importance of drawing out the design (on square paper) first. When gluing wood to corian or plastic – use flexible CA glue (rubberised) such as ‘Clean N Tuf’. 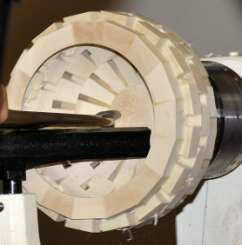 When using the thicknesser, to avoid ‘snipe’ insert the wood at an angle into the machine. If gluing end grain PVA is not suitable, instead use an aliphatic resin glue such as ‘Titebond’. However a 5 min. PVA is preferred for all other wood to wood gluing as most aliphatic glues can leave a stain. Always apply small amount to both pieces, rub and hold for 3 secs. Surprisingly Dennis insisted, DO NOT CLAMP. Dennis always uses and glues on an end ring to his projects, using an MDF disc in the tailstock (with concentric rings), to ensure an accurate line up. When dry, cut face (and sand) flat, then repeat for the next ring. 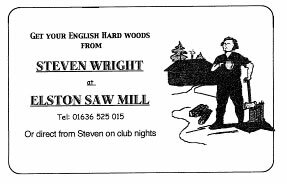 When turning turn the inside first – do not use a bowl gouge but a ‘Woodcut’ type is preferred or a good tungsten tip ring tool. 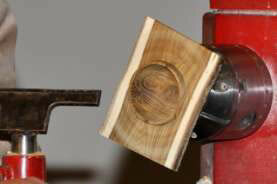 For the outside the use of a bowl gouge is OK.
finish the outside with a pull cut. An asymmetrical bowl was prepared to shape, with sandwiches of Perspex, some coloured, and 8 inch squares of plywood, 18mm thick. 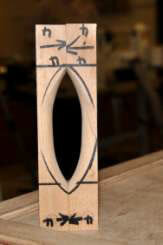 Birch faced grade B is adequate, using CA on perspex and PVA on wood to wood – this time clamp for several hours. Unfortunately whilst turning the outside a large section broke away. A bowl using Corian was turned. Used to use CA glue but Corian glue is far superior. The tungsten tip tool was used throughout. Finally a tall lamp of Corian, plywood and prespex was placed into the lathe and Dennis invited the audience to try the tungsten tip tool. Only one taker I’m afraid, yours truly. 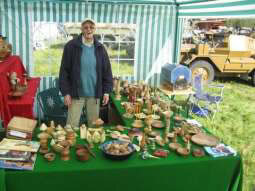 The day was excellent and to boost our numbers we had guests from the Lincolnshire Woodturners and from the Heart of England Woodturners. Our thanks go to Rachel for organising the publicity. Sue Harker – Wed. 10th Oct.
Sue is always a treat to watch and this evening was no exception. 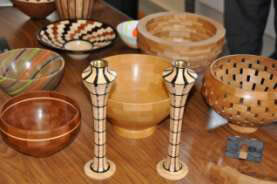 Sue gave a very informative presentation on involute turning, featuring the turning of a ‘back to back’ candleholder. 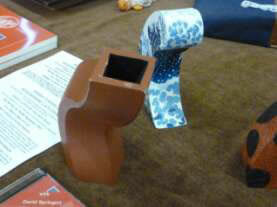 She began by preparing two short lengths of ash, each measuring 210mm x 38mm x 30mm. The sizes aren’t particularly critical, but it is essential that all angles are square and that the two pieces are identical. 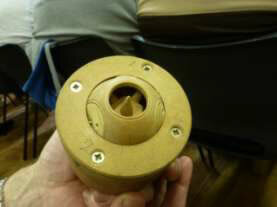 They were then joined together by means of a paper/glue joint and screws inserted at each end. Using a pre-formed arc template, lines were drawn one face of each half. The ends were centred and inserted on the lathe between two steb centres. 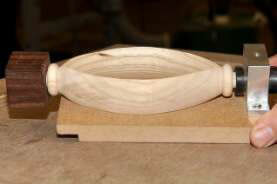 Using a ½” long fluted bowl gouge the wood was turned down to meet the lines – ‘gentle turning’ was the order of the day! 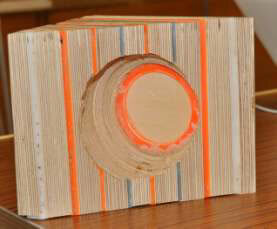 After sanding, the wood was then removed from the lathe and the paper/glue joint split. The halves were then reversed and glued together (no paper or screws) and re-inserted back into the lathe, when the waste wood at each end was removed and the ‘wishbone’ shape developed. A bead was then formed, about 2- 3mms from each end of the ‘wishbone’ hollow, using a self made ‘bead former’ to create them. 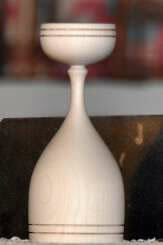 A ½” spigot was turned on each end, followed by a final sanding. During the past few months since the last edition we have had a variety of items made during the ‘Hands On’ sessions. Brian Thornton had an impressive evening with us making fruit in July. In September we had Malcolm Parkin having us making ‘Spirtles’ or ‘Spurtles’. Remember we have at least three lathes for these evenings, and the last one this year is on 24th October. So do try and join us for an enjoyable evening and it is only £3. Our Nominated Charity for 2012 – The Rutland School for Parents..
You may recall we agreed at the last AGM to support this school. The name is perhaps a misnomer as the school actually give children that suffer with Cerebral Palsy and severe Down’s Syndrome tremendous opportunities to develop, that otherwise would not be available. Your efforts in making charity items, over the past year, have paid off tremendously. We shall soon be going along to the School to present them with a cheque. If any of you wish to come along please see Trevor or me. In the New Year we may have a School representative along to explain what the funds mean to them. Several Competition Vouchers awarded following the David Francis Trophy in May have yet to be redeemed. To enable our Treasurer to complete the books before the AGM, please ensure they are redeemed by end February 2013.